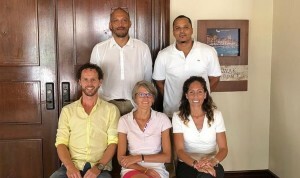 PHILIPSBURG - The physical therapy associations of Curaçao, Aruba, St. Maarten and The Netherlands signed a Memorandum of Understanding during the Spinal Cord Injury Congress 2018 in Curaçao in September. The goal is to improve collaboration between the different countries regarding the profession of physical therapy. During a meeting, the presidents of the three Caribbean associations – Gerold Brandon (Curaçao), Marlon Maduro (Aruba) and Peter Prinsen (St. Maarten) – together with board members, advisors and the quality and policy manager of the Dutch physical therapy association Koninklijk Nederlands Genootschap voor Fysiotherapie (KNGF), Edith van der Bent, agreed to collaborate on important topics, such as quality and assurance of paramedical care. Prinsen shared his thoughts on this effort with Health and Beauty recently. “This is an important step forwards and fits within the collaboration agreement of the Public Health Ministries of the four countries, which earlier this year signed a ministerial cooperation agreement that prioritizes strategic collaboration between the countries on different objectives to improve public health. The KNGF represents most of the physical therapists in The Netherlands and is responsible for the management of the quality register. To set up a quality register for the physical therapists in the Caribbean with the help of the Dutch association would be challenging; but – in the eyes of the associations – not impossible. The associations emphasize that collaborating with stakeholders such as public health workers and insurance companies, in the social or private sectors, is necessary to achieve these goals. Every individual association will work on that within their own country in the coming period. Besides working on quality regulations, there are different topics to mention in which physical therapists can be involved. The Public Health Ministers of the four countries made agreements to collaborate on the preventive care programs and education of healthcare professionals and to work together on programs to stimulate healthy lifestyle, sports and exercise. These are all topics where the physical therapists can play a leading role.